Wally’s Desert Turtle in Rancho Mirage, California, a Desert icon for over thirty-seven years, was established in 1978 by Mr. Wally Botello, the founder of the famed fine-dining Velvet Turtle chain. Now owned and operated by his son Michael, and his wife Nicole, the extensive menu serves contemporary Californian cuisine, prepared by classically trained Executive Chef Pascal Lallemand. The expert fine linen heavy silver service, serves to enhance the extensive wine list and the quality of the menu. In the main dining room, with interiors by famed designers Steve Chase and Randy Patton, the warm and elegant ambiance of the beveled mirrored ceilings, sparkling chandeliers, ancient Peruvian artifacts, and hand-painted murals combine for a sublime experience. The live nightly musical entertainment in the Sahara Lounge makes for a sparkling and special evening out in the Desert. Wally’s Desert Turtle has always attracted the Desert elite night after night, and is the restaurant of choice for many Hollywood celebrities, international dignitaries, and captains of industry. Wally’s has been enjoyed by such celebrities as Bob and Dolores Hope, Frank Sinatra, President Gerald R. and Mrs. Betty Ford, Benjamin Netanyahu, Wayne Gretzky, Carol Channing, Tom Hanks, Steven Seagal, and Barron Hilton. You never know who you might rub elbows with in the enchanting mirrored dining room. Wally’s serves dinner nightly, and is known for the wildly popular Friday Fashion Show Luncheon. The Holidays are also a busy and memorable time, celebrated by special menus and decor. 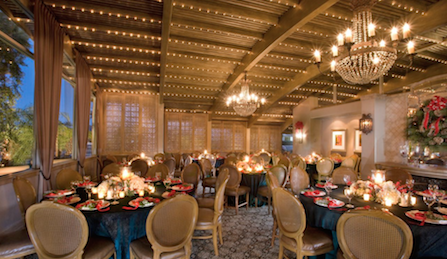 Private parties always shine brighter when held at Wally’s, and is considered the height of elegance here in the Coachella Valley. Our Special Events Department can put together an exquisite menu that will dazzle you and your guests. Catering is proudly offered as well, to bring that signature Wally’s experience to your home, or other venue. Wally’s is proud to be the exclusive caterer of choice for the Bob Hope Club during the Classic PGA Golf Tournament, as well as the Clinton Foundation of the Coachella Valley. “Farm to table,” “stem to root,” and “sustainability” are watchwords here at Wally’s Desert Turtle. We take great care in sourcing the finest in fresh ingredients from local vendors and purveyors, and are proud to support the ranches, farms, and fisheries that practice earth and ocean-friendly sustainable methods of production. Wally’s offers premium, natural beef from Aspen Ridge and Hercules Ranches, Berkshire pork from Salmon Creek Farm, Sustainable seafood from Loch Etive, free-range and organic poultry from Shelton and Maple Leaf Farms, and prime lamb from Napa’s Superior Farm. Whether you prefer savory dishes such as Sautéed Imported Dover Sole, Salmon Creek Pork Tenderloin, and Pan-Roasted Hercules Ranch Filet of Beef, or a sweeter dish such as our signature Grand Marnier Soufflé or our Warm Valrhona Chocolate Cake, the classically prepared meals will please every palate, and will satisfy the gourmet diner time after time. Whether you are a long-time local or a first-time visitor to the Coachella Valley, Wally’s Desert Turtle has a special taste of the Desert for everyone.